The aim of this research was to use non-invasive scientific analysis to uncover evidence of the planning process and relationship between pigments used in text copying and artwork production in the Oppenheimer Siddur (Oxford Bodleian Library MS Opp. 776), an illuminated 15th-century Hebrew prayer book. In many medieval Hebrew illuminated manuscripts, the authorship of the artwork is unknown. This manuscript’s colophon states that it was copied by its scribe-owner for personal family use but does not confirm who was responsible for the artwork. Prior deductive analysis suggested that the scribe-owner may also have been the manuscript’s artist, based on common motifs and an apparent shared colour palette appearing in both texts and artwork. Visual examination using high resolution digital images also identified points of contact between pigments used in the manuscript’s texts and artwork, raising questions about the pigment application sequence, and concurrent versus sequential text copying and artwork production. An in-house developed remote spectral imaging system (PRISMS) with 10 filters spanning the spectral range from 400 to 880 nm was modified for close-range application to image two of the folios to examine the sequence of production, identify the pigments and compare the materials used for the illumination and the text. Optical microscopy and Fourier Transform Infrared spectroscopy in the attenuated total reflection mode (FTIR-ATR) were used directly on the folios to complement the spectral imaging data in binding media and pigment identification. The results revealed close matches in reflectance spectra for the colorants and inks used in both text copying and illuminations, suggesting that the same mixture of colorants and inks have been used. The spectral imaging in the near infrared bands revealed a hidden underdrawing, indicating a design change during production of the manuscript, and the outlining of letters prior to coloured pigment being applied. The pigment use, the variation in the binder for different pigments and some elements of its production were found to be consistent with those described in historical sources. The evidence from this study supports the hypothesis that the scribe applied pigments for the manuscript’s artwork at the same time he did some of the scribal work which has implications for understandings of Jewish medieval visual cultures. Extant medieval illuminated Hebrew manuscripts are complex material objects and a distinct group of heritage artefacts which contain some features that are uncharacteristic of Latin manuscripts produced in the same era. The rate of literacy among medieval Jews was very high and, due the need for personal copies of religious texts, lay individuals often copied their own manuscripts [1, 2]. In addition, migrations of medieval Jewish individuals and communities means that Hebrew manuscripts made in geographically disparate locations sometimes exhibit common codicological and palaeographical characteristics, as well as similarities in the artwork [1, 2]. Along with the frequent absence of specific identifying information concerning the circumstances of production, this means that questions about their origins and past history cannot easily be resolved for many manuscripts.1 In the case of illuminated Hebrew manuscripts made in late medieval Europe, this challenge can be compounded by uncertainty surrounding the identities of the artists, and whether they were Jews or Christians [7–11]. We know that there were Jewish artists active during the later medieval period, but there is little solid evidence as only a few of these are known by name [12, 13]. One of the only surviving medieval treatises on paint recipes for book illumination is contained in a 15th-century manuscript that is in Portuguese but transliterated into Hebrew characters by a Jewish scribe, Abraham ben Judah ibn Hayyim, which suggests that this treatise was intended for a Jewish readership2 [14–19]. Yet whereas there are many scribal colophons, artists’ colophons or other information identifying those who decorated Hebrew manuscripts are rare3 [12, 13]. A number of scholars have convincingly argued that Jews and Christians interacted in the making of illuminated manuscripts and cooperated in manuscript production [1, 6, 8, 13]. We know there were Christian secular workshops in the late Middle Ages who participated in creating the artwork for some illuminated Hebrew manuscripts4 [8, 11, 20, 21], and a wide range of motifs can be seen in both Hebrew and Latin manuscript illuminations, making it clear that they shared a common repertoire of artists’ models [7–9, 22–25]. However, questions about artwork authorship in Hebrew manuscripts arise in interpreting illustrations which show the undeniable influence of Christian iconography but appear alongside Jewish texts, especially images which had strongly religious connotations when appearing in a Christian context [7–9, 24–27]. If Christian artists were involved in creating the images in a Hebrew manuscript on commission by a Jewish patron or scribe, to what extent do such images introduce a Christian viewpoint, consciously or unconsciously, into a Jewish book [7–10]? Conversely, if Jewish artists used models well-known in Christian artworks, do such images reflect or reinterpret the meanings as understood by Christians when intended for a Jewish audience [24, 25, 28]? These are long-standing issues that have been the focus of art historical studies of illuminated Hebrew manuscripts for over a century [28, 29]. Gaining greater understanding about the techniques, production processes and materials used by the artists of Hebrew manuscripts can add new information to consideration of these questions. Relatively little is known about the working methods of Jewish illuminators, since they were excluded from membership in medieval craft guilds which were often Christian confraternities . It is thus unlikely that Jewish artists were employed or trained as apprentices by Christian illuminators’ workshops. We are uncertain if they usually worked alone, or if there were multiple artists working together, or if they had systematic methods of work which paralleled those seen in the work of Christian illuminators. A great deal is known about the technical production of illuminations in Latin manuscripts, but despite the fact that Hebrew illuminated manuscript production occurred in parallel with Latin manuscripts in the late Middle Ages, to date mainstream discussions about medieval illumination practices have largely neglected Hebrew manuscripts5 . Studies in Hebrew codicology make it clear that the creators of Hebrew and Latin illuminated manuscripts shared some technical aspects of production [1, 2]. Indeed, ibn Hayyim’s treatise on paint recipes is a transliteration of the Portuguese vernacular and, while we don’t know if he made it for his own use or that of others, its contents imply it was made for practical use6 [14, 19]. 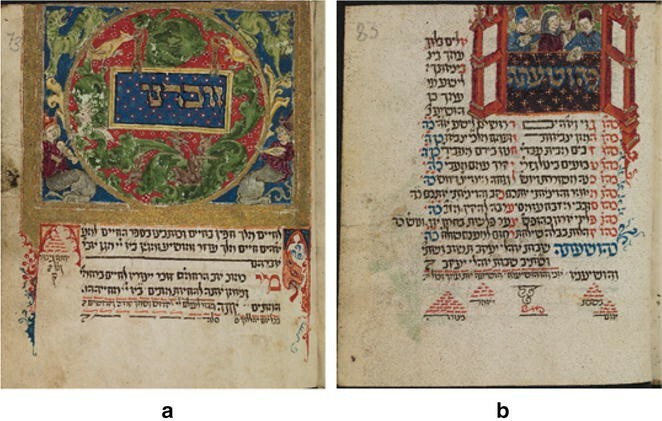 But more evidence is needed about the technical aspects of artistic production to piece together a clearer picture of the methods used by medieval Jewish artists in the decoration and painting of their books. The Oppenheimer Siddur (Oxford Bodleian Library MS Opp. 776) has unique features which make it an ideal case study for the application of scientific imaging techniques in order to investigate artwork authorship in a Hebrew manuscript.9 It is a richly illuminated, small-format, 15th-century Hebrew book of daily prayers according to the Ashkenazic rite of the Rhine region (Fig. 1). Information in the scribal colophon tells us that Asher ben Yitzḥaq finished copying the prayer book in 1471 for his family to use and therefore is classified as user-produced.10 The scribe’s hand appears in neat, semi-cursive Ashkenazic script throughout this small-format manuscript, written on fine parchment that has been scraped on both sides to achieve an equalised texture, a technique used in Hebrew manuscripts only in Germany after c.1300 . Despite the visually attractive qualities in the scribal work and illuminations, the self-made character of this manuscript is evident in the numerous copying mistakes and corrections made by the scribe, which would not be expected in the work of a professional copyist.11 The frequent appearance of performing musicians in the iconography of this prayer book is a distinctive feature, one that is both thematic and symbolic in relation to the prayers it contains . In addition, there are high quality illustrations of flora and fauna, wild men, a wide range of colours, and evidence of liberal application of gold in the illumination process, much of which has flaked off over time. It is clear from the contextualisation of the elements in the iconography that the illuminator had access to artists’ models that were in circulation in the 15th century, and was aware of the connotations as well as the forms of motifs adapted from contemporary Christian visual cultures [45, 46]. The amount and quality of artwork, combined with its documented user-produced provenance, make the Oppenheimer Siddur a rarity among extant Hebrew manuscripts. Yet although we know that Asher ben Yitzḥaq copied his own prayer book, the colophon does not confirm his identity as the artist. Numerous illuminated Hebrew manuscripts display a sequential production process, in which figural illustrations and painted miniatures have been added after all scribal work was finished. This is obvious in some manuscripts where layout and texts have been planned and copied, but blank space has been left for the addition of drawings and illuminations that were not finished, or pigments in the painting process have been only partially applied to existing drawings.12 In such cases, it is clear that copying of main texts and decoration, including the execution of drawings, occurred at separate stages of production. In the case of the Oppenheimer Siddur, all elements of text copying and artwork were fully completed. However, examination of different points in the manuscript using high-resolution (20 μm per pixel resolution) digital colour images revealed points of contact between the decorative coloured pigments and ink used at some points in the texts, as well as between the pigments of texts and those of illuminations, in an apparently inconsistent pattern of overlapping pigments (Fig. 2a–c). In addition, previous analysis of the manuscript showed that both scribal work and painted illuminations at times use stylistically similar ornamental decorative flourishes and floret motifs (Fig. 1b), as well as a similar colour palette (Fig. 2d) . These aspects of the manuscript raised questions about the sequence of scribal copying relative to the execution of artwork, and suggested the hypothesis that the scribe may also have been the artist . If a sequential production process were exhibited, with the copying of main texts preceding the addition of underdrawings and painted illuminations, it is probable that the artwork could have been done by someone other than the scribe. Conversely, if it were established that the copying, drawing and painting stages of the manuscript were done concurrently, and using the same pigments in both text copying and artwork, this could provide evidence that the artwork was executed by Asher ben Yitzḥaq. The Oppenheimer Siddur is very small13 and high resolution digital images alone proved insufficient to resolve these questions. Non-invasive scientific imaging techniques were sought to help clarify the sequence of production, and provide information about whether the same pigments were used in both scribal copying and painted illuminations, and to try to evaluate the implications of overlapping pigments between scribal work and painted artwork. This paper will show how spectral imaging and Fourier transform infrared spectroscopy in the attenuated total reflection mode (FTIR-ATR) were used to analyse the production sequence and pigments in the Oppenheimer Siddur in order to resolve questions regarding the artwork authorship for this Hebrew manuscript, and elucidate aspects of the production methods used in making it. Non-invasive analytical techniques were employed to gather data on a limited range of folios in the manuscript. Spectral imaging and FTIR-ATR were conducted in situ at the Bodleian library in 2009. FTIR-ATR (PerkinElmer) analysis in the wavenumber range of 400–4000/cm (or 2.5–25 μm) was carried out directly on the folios at the Bodleian Library as one of several case studies for an investigation of the applicability of this technique to address research questions arising about items in the Bodleian Library’s collection. As FTIR-ATR required contact between the instrument and the manuscript, care was taken not to apply too much pressure on the manuscript. The depth of penetration of FTIR in the ATR mode is less than a couple of microns, therefore the effect of substrate is unlikely to be important. A document imaging microscope (75× magnification) at the Bodleian was also used to assist the spectroscopic analysis in providing microscopic images of the details of the areas analysed, providing additional clues to the pigment mixture. Ideally, other complementary techniques such as X-ray Fluorescence (XRF) spectroscopy should also have been used to gather more information about the painting materials (e.g. similar to [38, 52]), however, instrument availability during the period and the accessibility to the manuscript was limited, as it was the subject of curatorial study in preparation for being featured in a five-month Bodleian Library exhibition and an associated publication. Reference spectra for common historic artists’ pigments and binders were collected with the same instruments as those used on the manuscript. The pigment samples were verified analytically as described in  and the paint samples were prepared in animal glue and painted on paper . The binding media samples included egg white, egg yolk, gum Arabic, animal glue and linseed oil, each prepared in thick layers (> 30 μm) such that the FTIR-ATR spectra would not be influenced by the substrate. As described in our previous publications [34, 48, 52, 54], pigment identification using reflectance spectra in the visible/NIR can be performed by using the Kubelka–Munk model  to find the best fits to an unknown spectrum using the various possible pigment combinations in the mixture while keeping the relative concentration of the pigments as free parameters. The pigment combination that gives a close match to the unknown spectrum is then the most likely mixture. While PRISMS has a low spectral resolution, it is however adequate for the identification of most pigments since pigment reflectance spectra tend to have broad features. There are only a handful of pigments that needs higher spectral resolution of ~ 5–10 nm to resolve the fine spectral features such as those of anthraquinone (main ingredient of madder and insect based red dyes such as cochineal and lac) and cobalt pigments. This initial investigation was intended to provide evidence that would be beneficial in answering specific research questions that had arisen about the sequence of production and authorship of the artwork. Spectral imaging was carried out on two illuminated folios (73r and 83r), while FTIR-ATR data was collected on 4 spots on f73r (red, crimson, blue and green) and one spot each on f83r and f86r (both blues). The selection of these areas was focussed on four types of evidence: (a) the planning process in both text copying and painted illuminations; (b) the relationship between pigments used in the illuminations and texts; (c) the relationship between coloured texts and the texts written in ink; and (d) the pigment and binder identification and their manner of use. The texts are mostly in black-brown ink but sometimes coloured in red, blue, crimson and green, with blue and red being more common (Fig. 2d). Visual examination by eye shows that there is no fixed sequence of production of the coloured text, as both red letters covering the edges of blue letters, and vice versa, can appear on the same page (Fig. 2c). The coloured illuminations are sometimes found to be covering the edges of the text in black ink (Fig. 2b) but on other occasions the text in ink is found to be written above the edges of the illumination (Fig. 2a). Spectral imaging of folio 83r provides evidence of the planning and production process. Vertical and horizontal ruling lines are clearly visible when viewed in the near infrared spectral band at 880 nm (Fig. 4), but barely visible by the naked eye. One bounding line runs vertically down the left side of the illumination, marking the position of both the illuminated panel and the coloured texts beneath it. The positioning of the initial word panel, written in larger letters and coloured pigments within the illuminated space, is also clearly related to the ruling lines. The horizontal ruling line for the second line of text forming the upper edge of the main word panel, and the text within the word panel is the height of two ruling lines. This suggests that pre-existing ruling lines were used to plan the proportions of the illumination in relation to texts, horizontally and vertically, consistent with ruling and planning practices identified in both Latin and Hebrew manuscripts [11, 31]. On the same folio, NIR spectral band at 700 nm revealed that red paint had been applied on top of a pre-copied black letter at the start of the third line of text in the column to the left of the illuminated panel (Fig. 4c, d). The text has an acrostic pattern and the scribe chose to rubricate the sequential letters of the Hebrew alphabet with red coloured paint. Here, in the NIR spectral band, black ink is visible at the upper right edge of the letter beth under the red pigment. Dark outlining of some red letters is also visible in NIR images at the right-hand section of text copied beneath the main panel (Fig. 4b, f).17 This second application using a red paint is likely to have been done by the scribe, as the formation of the strokes and contours of the red letters match closely those of texts copied in black ink as well as blue pigment on this page. The following possible sequence of production for this page is therefore suggested by this analysis: layout of the illuminated panel and texts was planned and ruled, followed by the copying of main texts. The execution of drawings for planned illustrations at this early stage is also suggested by the inclusion of the lightly sketched grotesque figure that was later not painted in. Although this is consistent with production practices for medieval manuscripts generally18 , given the closely matching spectra of inks used in both texts and final drawing lines on this folio (Fig. 5a) it is also possible that the drawing lines were done at the same time as the text copying. This was followed by the addition of blue scribal flourishes, and then the decoration of the bottom right corner of the architectural motif using red pigments, as well as the red texts. The many points in the manuscript where coloured pigments applied in the painting process are layered over elements of text in black ink make it likely that some of the text copying process, probably using iron gall ink, preceded stages of production using coloured pigments. There is textual evidence from medieval sources to suggest that carbon traditionally may have been added to iron gall ink for Hebrew manuscripts to ensure the permanence of black colour, as this was considered important in the copying of Jewish religious texts [11, 41]. It will be possible to verify if there is carbon present in this manuscript’s ink through Raman spectroscopy in future work. The copying of main texts in black ink prior to painting stages is consistent with the production methods apparent in many Hebrew and Latin medieval manuscripts. 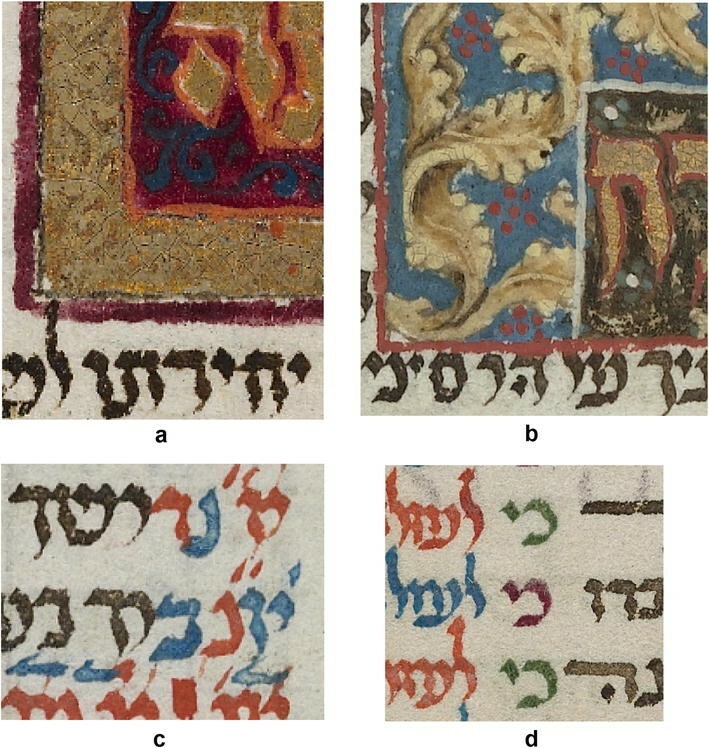 However, in the Oppenheimer Siddur, similar pigment colours appear in both texts and painted miniatures, and four colours that form a major part of the colour palette used to illuminate the manuscript are represented also in texts: blue, red, crimson and green (Fig. 2d). On folio 73r and 83r, the blue and red text were found to have similar spectra to the blue and red illumination indicating that the text and illumination were painted with the same paint mixture (Fig. 5b, c). On folio 83r, the spectra of the outline of the architectural motif in black ink and the text in ink on this folio are an identical match (Fig. 5a), and the dark shadow (or thick dark lines) in the red architectural motif (e.g. Fig 4c) is consistent in spectrum to the combination of the red pigment used in the red text and the ink of the text (Fig. 5d). This suggests that the same ink was used in both the drawn outlines and shadows of the illustration as well as the texts. It is clear from this spectral imaging analysis that the same materials were used in both scribal work and drawn and painted illuminations at least on the two folios examined by spectral imaging. This applies not only to coloured pigments used decoratively, but also plain black ink used for both main text copying and drawing lines. It would not have been possible to make this conclusion with confidence without the spectral reflectance extracted from the spectral imaging data. This initial stage of spectral imaging analysis has been limited to only two folios in the manuscript. However, this evidence of shared inks and pigments in the illuminations and texts, as well as the evidence regarding sequence of production, strongly support the hypothesis that the scribe was also the artist . Ibn Hayyim described in his treatise the common colours included azure, orpiment, vermilion, green, brazilwood19, carmine20, sunflower, saffron, red lead and lead white . Spectral reflectance of the red text and illumination from PRISMS are best fitted with vermilion reference spectrum out of the reference spectral library of historic artists’ paint [52, 53] (Fig. 5c). The orange areas were most consistent with a mixture of vermilion, red lead and indigo by fitting a Kubelka–Munk model to the reflectance spectrum of the region using the reference spectra of the 3 pigments (Fig. 6a). The microscope image helped the identification, since without this microscope image, one might not have considered the presence of a blue pigment. The Kubelka–Munk fit also showed that the addition of the blue pigment indigo (Fig. 6b) gave a better fit than just red lead and vermilion (Fig. 6a). It is common to use a mixture of red lead and vermilion in medieval manuscripts . Both the combination of cochineal and vermilion (Fig. 7a) and brazilwood lake pigment mixed with lead white (Fig. 7b) gave good fits to the reflectance spectrum of the crimson colour (Fig. 7a, b).21 Ibn Hayyim  recommended mixing of organic with inorganic pigments and this may be an example. To distinguish between cochineal and brazilwood, we need a higher spectral resolution reflectance spectrum (~ 10 nm spectral resolution and 5 nm sampling resolution) than offered by this version of PRISMS. Cochineal has distinctive narrow absorption lines in the visible range between 500 and 600 nm. At the time of the making of this manuscript in Europe, cochineal from South America was not yet available; however, cochineal from Poland or Armenia may have been available . The outline of the large letters in the word panel of folio 73r is consistent with the crimson colorant painted on the gold background (Fig. 7c). The spectrum of the blue text matched with the reference spectrum of azurite without any binding medium (Fig. 5b), which was also confirmed by FTIR.22 In addition, FTIR-ATR also examined the blue hat of the left figure in folio 83r and the blue text in folio 86r and found them both to be identified with azurite. Spectral imaging data showed that the best fit for the green area was a combination of verdigris and indigo and possibly with a yellow pigment like orpiment (Fig. 8a). Malachite combined with indigo and orpiment did not give a good fit. There was also no good fit with any plausible single green pigment. Indigo and orpiment is often mixed to produce green, but a combination of these did not give a good fit (Fig. 8b). In addition, FTIR-ATR spectrum identified lines consistent with indigo and verdigris. Future analysis with XRF can also be used to confirm the presence of copper green and arsenic containing pigments such as orpiment. There are some yellow areas on the folios, but as discussed in Kogou et al. , identification of most yellow pigments using reflectance spectra is difficult except for pigments such as yellow ochre. Future analysis with XRF and Raman spectroscopy will be better suited to the task. Future analysis using XRF and Raman spectroscopy is also needed to determine whether the preparatory sketches were made using plummet (or lead–tin alloy) or charcoal and whether the ink contains charcoal. FTIR-ATR spectrum of the red region within the roundel on folio 73r was compared with the reference spectra of a range of binding media including egg white, gum Arabic, egg yolk, animal glue and oil. It was found to have a spectrum close to the egg white reference spectrum (Fig. 9). The spectrum seems to have no feature other than those due to the binder, which is not surprising given the PRISMS data showed that its spectral reflectance in the visible/NIR is identified with vermilion which does not have spectral features in the FTIR spectral range. Egg white and gum Arabic are the most common binding media for medieval manuscripts in Europe . It was curious to observe that the FTIR-ATR spectrum of the blue hat of the left figure in fol. 83r showed many of the lines of gum Arabic in addition to those of azurite (Fig. 10). As discussed above, this blue is identified with azurite from its visible/NIR reflectance spectrum (Fig. 5b). It seems that a different binder might have been used in at least some of the blue areas. Ibn Hayyim described different binder mixtures to temper different colours23 . For example, in Chapter 6 the method he prescribes to temper blue is to use gum Arabic and egg white (or egg yolk), presumably because the common blue pigment azurite does not bind very well with egg white24 . This may be an evidence for such a practice. This investigation applied non-invasive techniques, spectral imaging, FTIR-ATR and optical microscopy to explore the manuscript’s production sequence and use of pigments in text copying and artwork. This contributed new information to our understanding of the role Asher ben Yitzḥaq had in the design and execution of the painted illuminations as well as text copying in the Oppenheimer Siddur. Evidence gained through scientific analysis about the production sequence, including the range of coloured pigments as decorative elements in the texts, as well as pigments found in both texts and artwork on several folios, support the hypothesis that he participated in creating the artwork. As has been discussed in our other publications , it is clear that he was familiar with Christian iconography and its meaning. Confirmation of Asher ben Yitzḥaq’s role as the artist as well as scribe of this manuscript allows the interpretation of the many illustrations it contains as wholly Jewish artistic creations, unencumbered by questions of Jewish versus Christian authorship, since we can be reasonably sure of his authorship and intentional contextualisation of artwork in relation to prayer texts where illuminations occur. Because we know the scribe made this prayer book for his own private family use, this has implications for interpreting the content and meaning of the illustrations it contains, as it was intended for a closed audience. This is significant, not only for interpreting the iconography in this manuscript, but for that of other Hebrew illuminated manuscripts which exhibit similar characteristics, and our understanding of medieval Jewish visual cultures more generally. The range of pigments identified and the manner in which they were used is largely consistent with historic sources on manuscript production. Egg white was found to be the most likely binding medium, while gum Arabic appears to have been used in some of the blue areas. Future studies could apply a wider range of techniques (e.g. similar to [34, 52]), such as XRF, Raman spectroscopy, high spectral resolution reflectance spectroscopy in the visible and NIR which could confirm the pigments and inks identified, and the materials used in the preparatory sketch. High spatial resolution optical microscopy would assist in the confirmation of the pigment mixture and optical coherence tomography for determining the layering sequence of the colorants. In addition, collection of scientific data on pigment layers found in both texts and illuminations throughout the manuscript on a greater number of folios would help to gain a holistic view of the production process and the range of binding media used for the variety of colorants. It is important to keep in mind that no single technique is superior to other techniques and that the various techniques complement each other (e.g. this is well demonstrated in ). There has been relatively little research of this kind to date in the field of Hebrew manuscript studies, and none that address the kinds of specific authorship issues that have arisen from close study of this manuscript. 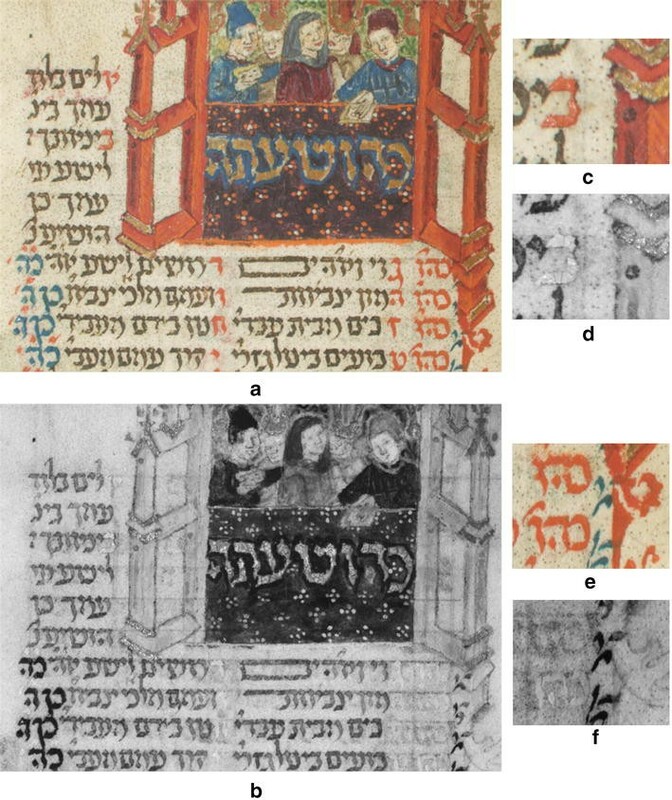 This research confirms the significant potential of non-invasive scientific imaging and spectroscopy to add new information to the slim body of knowledge currently available on the working practices and production methods of Jewish artists, and to help resolve long-standing questions surrounding the artwork authorship of medieval illuminated Hebrew manuscripts. For example, the older, illuminated part (probably 14th century) of the Barcelona Haggadah, British Library MS Add. 14761, is described as having Catalonian origins in the British Library Catalogue, based primarily on art historical grounds linking the appearance of shields bearing the colours of the House of Aragon on fol. 61r to the city of Barcelona, as discussed in . Based on codicological and palaeographical analysis by Beit-Arié and a recent art historical study by Cohen and Kogman-Appel has asserted a more likely south French provenance, since Sephardic scripts were used also in the southern French regions of Provence and Bas-Languedoc after the Christian reconquest of Spain, and the text has been linked with the rite of Carpentras in southern France. See [4–6]. Ibn Ḥayyim’s Livro de Como se Fazem as Cores das Tintas (Parma, Biblioteca Palatina MS 1959) is written on paper bearing 15th-century watermarks, and should probably be dated to 1462. See Cruz and Afonso , Cruz et al. , Matos and Afonso  and . Jewish illuminators known by name include: Joseph ibn Ḥayyim, artist of the Kennicott Bible (Oxford Bodleian MS Kenn. 1); Joel ben Simeon, who produced numerous manuscripts in Germany and Italy in the 15th century; Shemaya ha-Tsarfati; Joseph ha-Tsarfati; and Vidal Abraham. The presence of micrography in graphic designs in Hebrew manuscripts, a feature unique to their artwork, also attests to the activity of Jewish artists. For more detailed discussion, see [11–13]. For example, in the Rothschild Miscellany (Jerusalem, Israel Museum MS 180/51) the artwork is thought to have been done in the workshop of Bonifacio Bembo and illuminator’s instructions including Arabic numerals, rather than Hebrew characters, are hidden in the margins indicating they were probably used by Christian artists, not Jews. See: Beit-Arié  and . For example, no Hebrew manuscript illuminations are discussed in the classic work on medieval illumination methods by Alexander . The general lack of information about Jewish artists is discussed by Epstein [28, p. 38–39] and mentioned by Sirat [11, p. 163–170]. As noted by Cruz and Afonso , and suggested by Afonso and Matos . See  for a full discussion of codicological and palaeographic elements contributing to this later dating of the entire manuscript, as well as discussion of evidence supporting the hypothesis that the larger compilation of works among which this treatise is found is a collection of works intended for use in medieval Portuguese Hebrew Illuminated manuscript production. On the possibility of a Jewish school of illumination in Portugal see Afonso . Cohen and Duffy have shown the applicability of multispectral imaging to reveal erasures and elements of the original decoration program of British Library MS Add. 26957 [39, 40]. As discussed by Stavisky and Centeno [41, p. 3]. The full manuscripts may be viewed at http://www.jtslibrarytreasures.org/viewer/zifthumbs.php?image=images/Prato_Haggadah_001a&thumbs=prato#/. Oxford Bodleian Library MS Oppenheim 776, viewable at . On the phenomenon of the medieval user-produced book, see Beit-Arié [2, p. 14–15]. Observations concerning the many copying errors in this manuscript were made in personal correspondence to SW from Hebrew liturgical manuscript expert Dr. Nahum Weissenstern of the Institute of Microfilmed Hebrew Manuscripts, National Library of Israel, who examined this aspect in detail. E.g. The Prato Haggadah. See: n. 7. Other examples include: Hamburg Staats- und Universitätsbibliothek Cod. hebr. 37, fols. 32v and 74v; British Library MS Add. 14761, fol. 48r and MS Add. 26896, fol. 213v; Oxford Bodleian MS Regg. 2, fol. 31r. Average folio size: 94.3 × 81.7 mm. Source . nip2 is a graphical user interface that uses VIPS image processing library tailored to imaging requirements of paintings https://github.com/jcupitt/nip2. These occur on fols. 48r, 67r, 73r, 79v. As discussed by Wijsman . Christopher de Hamel notes that once the design made by lightly sketching an initial with plummet (or charcoal) is completed, it would be picked out carefully by pen or ink before applying paint. This is apparently because it is difficult to apply paint smoothly over a plummet (lead–tin alloy) drawing . It is important to bear in mind that de Hamel’s book focused on Latin manuscript production in Christian workshops, but evidence of the use of lead point for preparatory drawings is also seen in medieval Hebrew manuscripts, e.g. , Fig. 6a, p. 16. In relation to Latin manuscripts, as described by Alexander in [31, p. 40–42], de Hamel and Clemens & Graham in [57, 58] and in the Prato Haggadah as described in . In this period, it is really sappanwood from Asia that was used rather than the later brazilwood from South America. However, in this 15th C Portuguese treatise, it is called simply ‘brasil’, a cognate for ‘brazilwood’. For the history of sappanwood and brazilwood in Europe, see . In Ibn Hayyim’s treatise , both lac and brazilwood were mentioned in the making of carmine. Our reference lac lake spectrum did not give a good fit, either by itself or combined with vermilion. However, the spectrum of dyes can shift according to the pH and we need to be cautious in the interpretation. Both lac and cochineal contain red anthraquinone dyes derived from insects. See Fig. 10 for a comparison with a standard azurite FTIR spectrum which showed the same spectral features. Ibn Hayyim in his treatise  mentioned various tempering methods: blue is tempered with gum Arabic and egg white or egg yolk, rose colours made from brazilwood lake is tempered with gum, verdigris with gum or egg yolk and gum, carmine colour is tempered with egg yolk, saffron is tempered with egg white, orpiment with egg yolk, black indigo is tempered with gum and egg yolk. They seem to use the most appropriate binder combination for each pigment or pigment mix. Cruz and Afonso  mentioned that by the 14th century gum Arabic was increasing used instead of egg white especially in the case of the blue pigments. That Ibn Hayyim refers here to azurite is likely given that he gives different instructions about how to temper lapis lazuli (ultramarine) in the next chapter, Ch. 7. See [18, p. 122]. SW posed the art historical research questions and drafted the introduction and parts of the other sections of the manuscript. SN initiated the collaboration, liaised between the Bodleian Library and the other authors, conducted FTIR-ATR analysis directly on the manuscript and drafted a preliminary report for the overall project. SK analysed the spectral imaging data and contributed to the results and discussion section. HL coordinated the spectral imaging data capture and analysis, wrote the code for pigment identification, conducted the preliminary analysis of the spectral imaging data and drafted the science part of the manuscript. All authors commented on the draft. All authors read and approved the final manuscript. SW is Associate Professor in the School of Music, University of Western Australia. SN was a Ph.D. student at the Research Laboratory for Archaeology and the History of Art and the Conservation Department of the Bodleian Library, University of Oxford. SK is a Ph.D. student in the Imaging and Sensing for Archaeology, Art history & Conservation (ISAAC) Lab of the School of Science and Technology, Nottingham Trent University. HL is Professor of Physics and Head of the ISAAC team of the School of Science and Technology, Nottingham Trent University. We are grateful to the following colleagues for assistance: Simon Godber, David Parker of Nottingham Trent University (NTU) for technical assistance, Kafing Keita of NTU for assisting with the in situ imaging of the manuscript at the Bodleian Library using the PRISMS spectral imager, Duncan Lindsey (work experience student at NTU) for assistance with post-processing of the spectral imaging data, Piet van Boxel of the Bodleian Library for facilitating access to the manuscript, Malachi Beit-Arié of the Hebrew University for advocating the use of scientific imaging analysis. HL is grateful to David Howell for hospitality during the visit. Funding from the Bodleian Library for the in situ imaging campaign is gratefully acknowledged. Funding from UK EPSRC Grant (EP/E016227/1) is acknowledged for the development of the PRISMS spectral imaging system. Cohen E. The illustrations in Maraviglia’s prayer book (Add MS 26957). London: The British Library; 2016. https://www.bl.uk/hebrew-manuscripts/articles/the-illustrations-in-maraviglias-prayer-book. Accessed 11 July 2017. Duffy C. Shedding new light on marginalia mysteries. London: The British Library; 2016. http://www.bl.uk/hebrew-manuscripts/articles/shedding-new-light-on-marginalia-mysteries. Accessed 11 Jul 2017. Stavisky N, Centeno S. The Prato Haggaah: an investigation into the artists’ and scribes’ materials and techniques and conservation treatment. In: The Prato Haggadah: companion volume to the facsimile edition, New York: Library of the Jewish Theological Seminary; 2007. p. 1–51. http://www.jtslibrarytreasures.org/viewer/zifthumbs.php?image=images/Prato_Haggadah_001a&thumbs=prato#/. Accessed 17 Jul 2017. Oxford: The Bodleian Library. http://bav.bodleian.ox.ac.uk/digitized-items-hebrew-manuscripts. Accessed 17 Jul 2017. Sfardata. The codicological database of the Hebrew palaeography project: record 0C158. http://sfardata.nli.org.il/sfardatanew/Home.aspx. Accessed 22 Dec 2017.